Based on estimates, the number of people who’ve reached the summit of Mt. Everest is 3,425. If you think this number is very small compared to the world’s population of seven billion, consider this: An estimated 625 people have ever swam from Europe to Africa via the Strait of Gibraltar. One of those 625 swimmers lives right here — in Banilad, Cebu City. Sebastian “Basti” Lacson is this rare individual — and possibly the only Filipino — to have ever done a marathon swim between these two continents. Today, Basti is popularly known as one of Cebu’s top executives; with the Visayan Electric Company, Inc. (Veco), he’s the Chief Operating Officer. But back in 1996, Basti was operating chiefly a different type of challenge: swimming (from Spain to Morocco) one of the toughest crossings on earth. “Dear John, Thank you for your interest in that swim which, in more ways than one, shaped the person that I am today. That self-imposed test of will taught me many things, showed me what to do and what not to do in life. It opened many doors, as it continues to do today. It establishes a reputation that precedes me in many things I do. “Your interest led me to dig up my files and thereby recall, once more, exactly what I was thinking back then in 1996. Much of what we do, especially when young and carefree, we cannot readily explain the reasons for. Only later, looking through life’s rear view mirror, can we understand precisely why we chose that course of action. My diary entry for 30 September 1996 states, in response to my very own question, ‘Why am I doing this?,’ states ‘Too see the face of God’ as the reason. “The swim was a challenge. One fateful April Sunday in 1996, I happened to be lunching with a cousin in Castelldefels, a coastal town south of Barcelona. She had arranged for a friend of hers to join us. This friend was Andreu Mateu, a Spanish adventurer and explorer. Over lunch, he regaled us with stories of his numerous adventures, among them his swim across the Strait of Gibraltar. He added that he was planning to do the swim once again in October of that year. Without any hesitation, I signed on. “Why was I so quick to get myself into such a commitment? I was winding up my MBA and was having some difficulty landing a job in Europe. I felt I took the MBA too young (I started at 24, the youngest in our class) and perhaps companies I interviewed sensed this. I was trying to keep a long-distance relationship with my girlfriend, who was herself studying in Boston, alive. Working back in Manila after an MBA in Barcelona worried me. Looking back, now I know why I was so audacious as to commit to the swim despite my complete lack of swimming background: I needed something to catalyze success into my life. “I eventually ended up back in the Philippines and worked in our family enterprise. Four months before October, I started to train. My simplistic regimen was this: swim until I could swim no more. No interval, no stops, no pulse-taking. Just swim non-stop. Two weeks before the swim, I was doing 10 kilometers per swim, which I thought was sufficient preparation. All this time, I became obsessed with the swim and my life was work and training. My Boston girlfriend, who by then had also returned to Manila, decided she had had enough neglect and called it quits. At that point, it didn’t seem like I cared. “My sponsor was the now-defunct Pilipinas Bank, whose president was the gentlemen banker Carlos “Lito” Pedrosa. He gave me USD1,000 which, if you look at the expenses indicated above, was just on the money. My father sponsored the ticket to Spain and gave me some money for meals. “On October 5th, the winds died and we planned for an early start the following day. We started at 6:56 am of October 6th from Punta Marroqui in Tarifa. Led by one of our guide boats, a small zodiac, we made for a southwesterly tack, swimming into the Atlantic Ocean. This is against the current which is from the Atlantic to the Mediterranean. This was very tedious although necessary in order to get to out intended destination: the beaches of Punta Cires in Morocco. So tedious was this first part of the swim that it took about 3H 30mins (out of 5H 19mins total) to cover less than half the total distance of the route. Once the critical inflection point had been reached as determined by our fishermen-guides, we drifted southeast with the current until we reached the beaches of Morocco. We had forgotten to bring our passports (something you don’t normally bring when out swimming) and when we spotted armed men waiting on the beach, we opted to dive down, touch sand, and motored hurriedly back to Tarifa. We had done it: left Spain at 6:56 am, got to Morocco 12:15 pm. 5 Hours and 19 minutes from Europe to Africa. For further verification, please consult the ‘neoprene’ category in www.acneg.com, website of the Strait of Gibraltar swim association. “The swim did turn out to be a good thing. I got my first good job because of it. The Spanish guys interviewing said that I could ‘do anything if I could swim the Strait of Gibraltar.’ I realized the value of working tirelessly for a goal and of the value of deferring the reward until the end. I apply those virtues at home, in the workplace and in sport, where my love for endurance tests stills persists. I also realized that in life, balance is necessary, that I cannot ignore all else just to pursue some single-minded objective, like I did with the swim. As for the girl in Boston, well, we married in 1998 and now have two wonderful children. So I guess that got sorted out. COMMENTARY ON SPORTS. My discussion about sports with Basti did not end with his Strait of Gibraltar swim. Basti has been a lifelong sportsman. Back in college at the Ateneo, he was captain of the Blue Eagles basketball team. John: Given that we’re a country of 7,107 islands, it’s a wonder why swimming is not that popular; why do you think this is so? Basti: The islands and beaches are for having fun and frolicking. Swimmers are bred in public swimming pools, and we don’t have any. To expand the talent pool of any sport, public sports facilities must be available and young athletes must be able to revolve their sporting and social lives around those sporting facilities. This applies to tennis, soccer, swimming, cycling, table tennis and the like. If one wants to swim in this country, where does one go without spending much money or becoming a member of a private club? In other countries, municipal facilities provide the breeding ground for what later become world-class athletes. Once in a while we will produce an Akiko Thompson (very well to do parents), or import soccer players from Europe, but our talent pool is not rich because we have chosen, as a society, not to invest in sport. Since there is nowhere to swim, we won’t produce many fine swimmers. John: What do you think of the Olango Challenge (which just finished two weeks ago) and the long-distance swims? 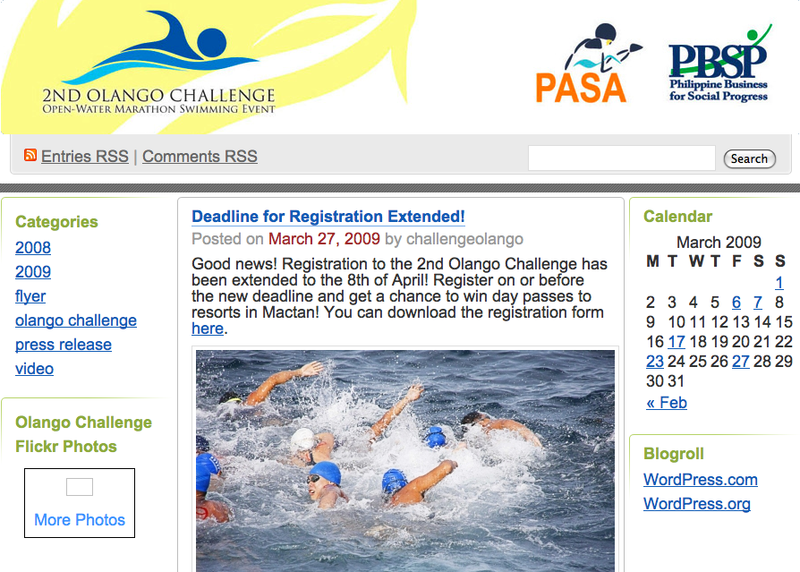 Basti: The Olango Challenge is a great opportunity to experience the delight of open sea swimming. We should have more of it. John: Do you still swim nowadays? Any events you’re targeting? What exercise keeps you busy? Basti: Recently I’ve started swimming again and have been doing 2. 5K workouts whenever possible. It isn’t easy to find a decent 25-meter pool in Cebu. When in Manila, I try and swim every day since I have access to a nice 25-meter pool out there. I just do it for my own conditioning. I haven’t caught the triathlon bug yet. I have a bias against sports that require heavy investment. I’m a bit of a purist in that the best sports for conditioning are the ones that require minimal investment and maximum effort. John: Why is sport so important in life? What lessons can one derive from sports? What have you personally learned from sports? Basti: Sport means different things to different people. Sports and/or music in young people set the important keystone habits that unlock other beneficial traits that will help them throughout life. They underscore the need to practice relentlessly to excel at something. In this age of instant just-swipe-your- I-Pad gratification, this value can be forgotten, to the detriment of the child. They underpin the need to set priorities and follow schedules. They teach a child how to win, and how to lose. Sports and music create friendship bonds that last longer than other friendship contexts. To win and to succeed in music and sport, one must rely on teammates, coaches and parents. Winning by cheating is frowned upon, also a valuable learning point. Once we get older, sport becomes important in staying fit and healthy. It releases much of our angst and tension that can accumulate because of work and the like. We also need to accept when the body starts slowing down and the next generation come in and take over. That is life’s cycle. First, the Speedo 3.5.8 Open Water Race in Anilao, Batangas (November 4). Race Distances are 3k, 5k, and 8k. Plus, the Swim Masters Series at the Village Sports Club, BF Homes, Paranaque (November 10). Various events of all strokes (50m, 100m) for the following age-groups: 20-24, 25-29, 30-39, 40-49, 50-59, 60-above. For more information, visit www.sportsmgt.ph. The Michael Phelps of the Philippines? His name is Maxime Rooney. You’ve never heard of him before. The only Rooney you and I know of is, of course, Wayne Rooney — the football star of Manchester United. Maxime is 14. And, guess what? Though he’s lived in the US all his life, he’s half Filipino. Maxime is a swimmer. Not your ordinary varsity star — but someone whose best times on the pool can rival those of a younger Michael Phelps. It was Harry Radaza, the sports czar and City Councilor of Lapu-Lapu City, who emailed me this amazing find a couple of weeks ago. How good is Maxime? In the 14-and-under category of ALL swimmers in the United States, he ranks the following: 1st, 100m freestyle; 1st, 200m freestyle; 1st, 400m freestyle; 1st, 200m backstroke; 2nd, 100m backstroke; 1st, 200m butterfly; 2nd, 100m butterfly; 1st, 400m individual medley. Of the thousands of Michael Phelps-wannabes in America, he is the young Michael Phelps. Want to hear even more scintillating news? When Phelps joined the 13-14 years old category, his best time in the 200m freestyle was 1:55.37. That ranks him 8th in the all time list in the US. Maxime Rooney? Better than Phelps: 1:54:41 — ranking him No. 5 in the all-time fastest list. Harry, his wife Mayann and their son Zach were fortunate because, just a few weeks ago in the US, they witnessed Maxime’s record-setting 1:54:41 time. Upon receiving Harry’s email, I forwarded this to Guy Concepcion, the Olympian swimmer who represented our nation in Seoul, Korea in 1988. That would mean Jessie Lacuna, the only Filipino male swimmer to compete in next week’s Olympics. “For the 400m Freestyle, there’s another Pinoy training in the States, but I don’t know his current status, but his personal best time is faster than Maxime so far. 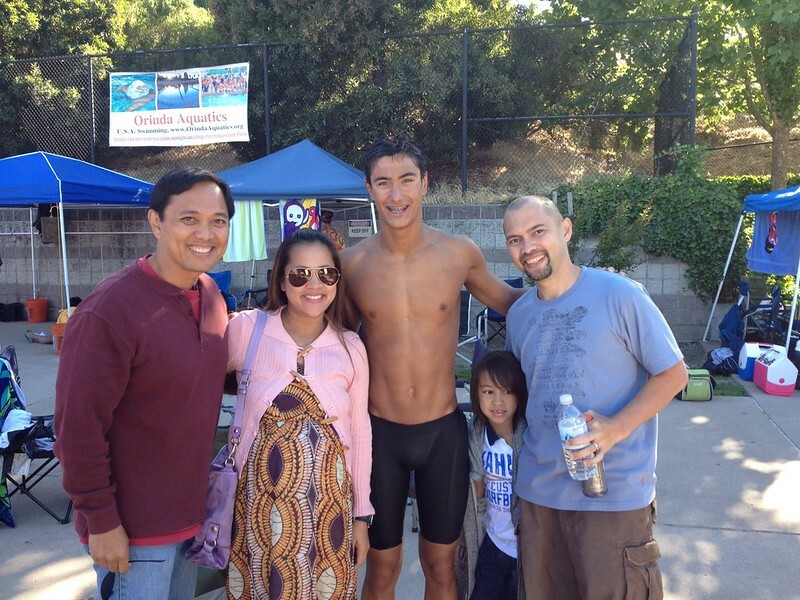 Maxime’s 100m butterfly time would rank him high in the Philippines now also. Guy advised that we send Maxime’s accomplishments to the head of the Philippine swimming NSA. That’s Mark Joseph, the brother of our fellow Cebuano, Dondi Joseph, and one I’ve communicated with when I went to the Beijing Olympics four years ago. “Present Maxime’s Filipino background, therefore, the Olympic committee can determine his true eligibility. Most important, Maxime should always send his times so if there is an upcoming major competition (SEA Games, Asian Games, etc), then they can see if Maxime can compete. I hope he does,” said Guy. Yes, I hope Maxime does. True. The Chairman for the Visayas of the PBSP (Philippine Business for Social Progress), Mr. Aboitiz explained the various initiatives of his organization. Tonio also discussed a sporting event. A marathon, he called it. Only, this time, unlike the many races on foot that bombard the streets of Cebu, this one uses the feet in a different way. Two nights ago when we met, Tonio counted 85 participants for the 2011 edition. “This is the biggest we’ve had,” he said. And, my guess is, this number will balloon to over 100 swimmers. The deadline for registration is on Saturday morning, the day of the race, this April 30. The race begins at 10 a.m. Late registrants can go to Tambuli by 8 a.m. and still join. What’s fun about this event is it’s not all-serious. Yes, for the serious “dolphins” like Paula Abigail Vega, Erika Lukang, Nikita Dacera and Michael David, there is prize money (P10,000 to the champion). But, to the rest of the non-competitive swimmers, there is a 2K swim and a 6K relay event. “Swim for Nature, Swim for the Future.” That’s the tagline for this Saturday. It makes sense. You swim with nature to help preserve water; the proceeds of the swim go to “the future,” the children of Olango. Mark Joseph and Lex Reyes of the Philippine Aquatic Sports Association (PASA), the two honchos of the national organization, will be here to join. (Mark is the brother of Dondi, the president of the Cebu Business Club.) To those interested, call Riva Valles of PBSP at 2325283 or 2325270. You can also visit olangochallenge.wordpress.com. KICK off those running shoes and put on your swimming caps; the time has come to take your athletic skills away from fun runs and test them in the open waters of Mactan Island. 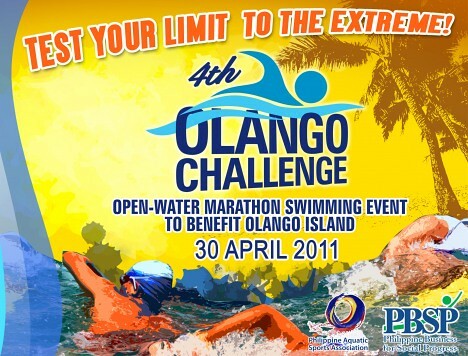 Philippine Business for Social Progress (PBSP) and Philippine Aquatic Sports Association (PASA) invites all competitive and non-competitive swimmers to join the 4th OLANGO CHALLENGE, a fund raising open water swim for the benefit of the people of Olango Island. The event will take place at Tambuli Beach Club on April 30, 2011 from 11:00 AM to 4:00 PM. 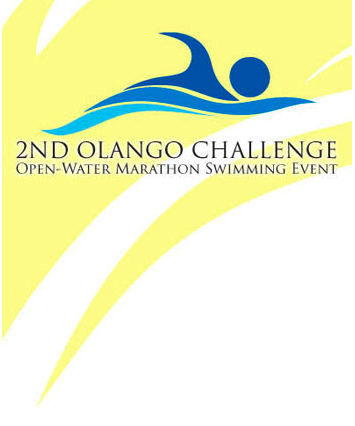 Launched in 2008, the OLANGO CHALLENGE was crafted with the same dynamic as that of the open water swim category of the Beijing Summer Olympics to help promote open water swimming marathon discipline in this country. The swimming event also serves as an advocacy campaign to highlight the importance of a clean marine environment and raise awareness about the high incidence of drowning in the Philippines. For four years now, the OLANGO CHALLENGE continues to help improve the lives of 2,300 families on Olango Island through the delivery of basic social services, the provision of sustainable income opportunities and the rehabilitation of the unique environment of the island. Proceeds of the past Olango Challenges went to the construction and refurbishment of classrooms, the promotion and practice of organic vermiculture and the greening of Olango Island. The 3rd Olango Challenge allowed for the reforestation of 5,200 trees on Olango Island. The construction of another two-room classroom building for the public elementary school at Barangay Caw-Oy shall begin next week and should be completed in time for the 2011-2012 school year. Proceeds of this year’s Olango Challenge are programmed for use towards an extensive reforestation effort of Olango Island. Winners of last year’s Olango Challenge include Rey Suerte and Alali Ada Villocino for the 1.5K. Competitive Category; Jason Ong and Lorhiz Echavez of the 2.5K Competitive Category; Nikita Dacera. and Erika Lukang of the 5K Category and Franz Baguio of the 5K Fun Category. Interested entrants of the 4th Olango Challenge may join the 2K and 6K competitive, competitive relay or the fun categories. Registration is pegged at P500.00 for the 2K and 6K competitive swim, P500.00 for the competitive relay category and P2, 000.00 for the fun category. Discounts will be given to those who register on or before April 8, 2011. 4F PLDT Building, Juan Luna Ave.
Tonio Aboitiz asks: Swim 6.4 kms. Mention the name “Marathon” and what definition comes to mind? Long-distance road-running that stretches as far as 42 kms., right? Right. Well, there’s another type of marathon that you probably haven’t heard of. This time, it’s not on the asphalted road—but on this vast God-given resource that occupies 71 percent of the earth’s surface: Water. “Open sea marathon” is its name and, in our country of 7,107 islands, it’s the only event that exists—and it’s right here in Cebu.